I have just one opening remaining for the final weekend in April. Please call or text today if you have an event during this month. We are fully booked at this time for all dates until 4/22. Cake pops are chocolate inside and the bunny is white cake with buttercream and fresh raspberry filling, iced in buttercream and covered in sweet flaked coconut. So delicious! Easter will be here before you know it and Hidden Gem Cakes in Anthem has you covered. Place your orders now so that the bunny can bring something extra special this year. 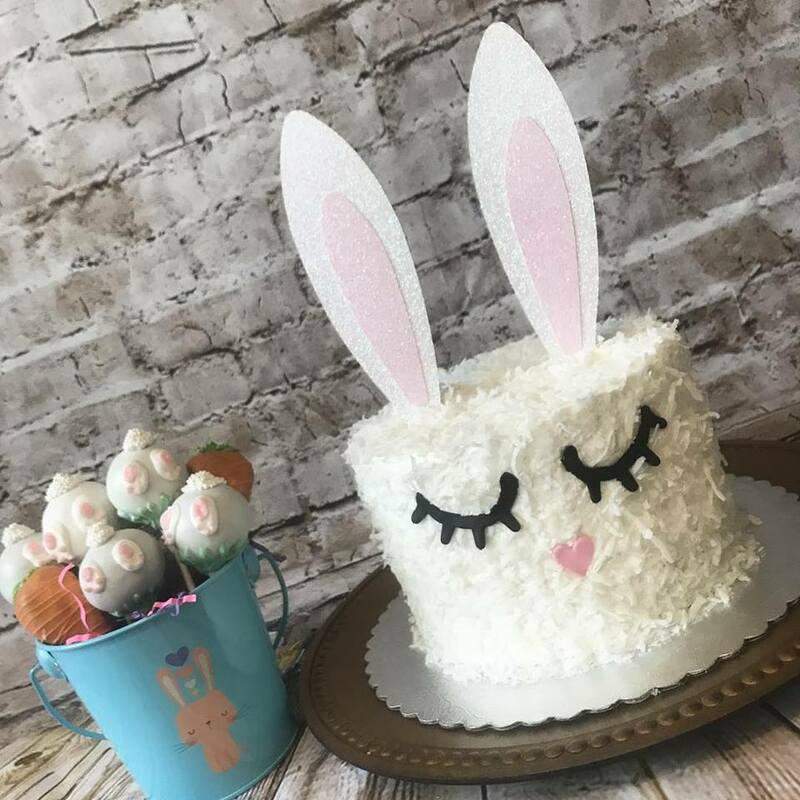 Hidden Gem Cakes will have super cute Easter bunny cakes (in a similar style to the very popular Unicorn cake) available in 6 inch, 7 inch & 8 inch sizes. Photo sample coming soon! Call or text today for pricing & flavors. All orders for Easter bunny cakes must be placed by March 15th and picked up on 3/30 or 3/31 in time for your Easter celebrations. I am also running specials on Easter themed cake pop buckets. 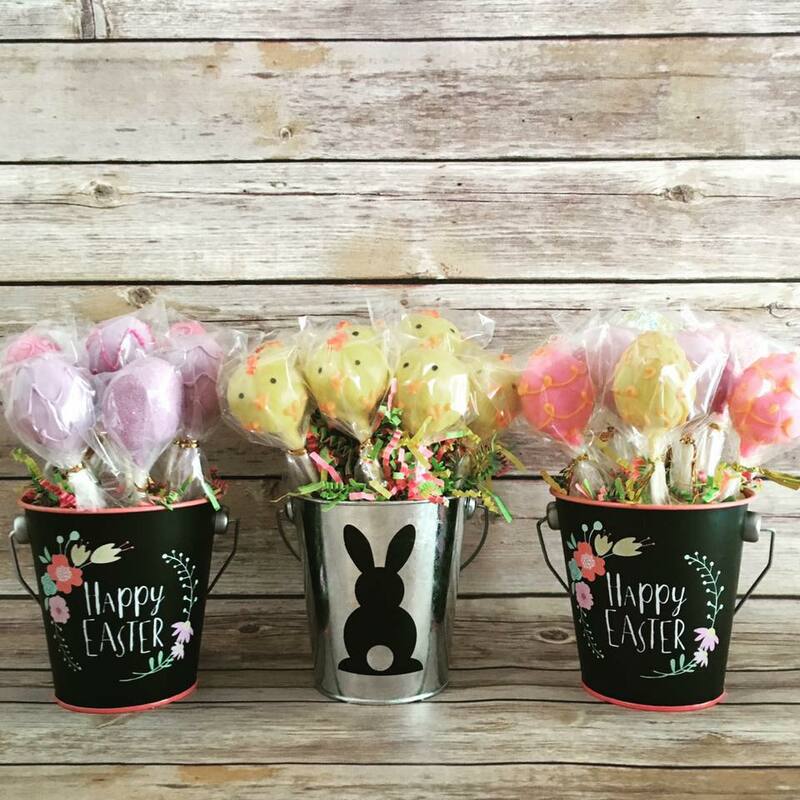 These buckets will include one bakers dozen in a mixed design of Easter themed cake pops in your choice of chocolate, vanilla or half and half chocolate and vanilla. All Easter cake pop gift buckets are beautifully gift wrapped and cost just $36 for a bakers dozen. Orders for the cake pop special must be placed by March 21st and picked up on 3/30 or 3/31 – delivery is available at an added cost based on location and time.